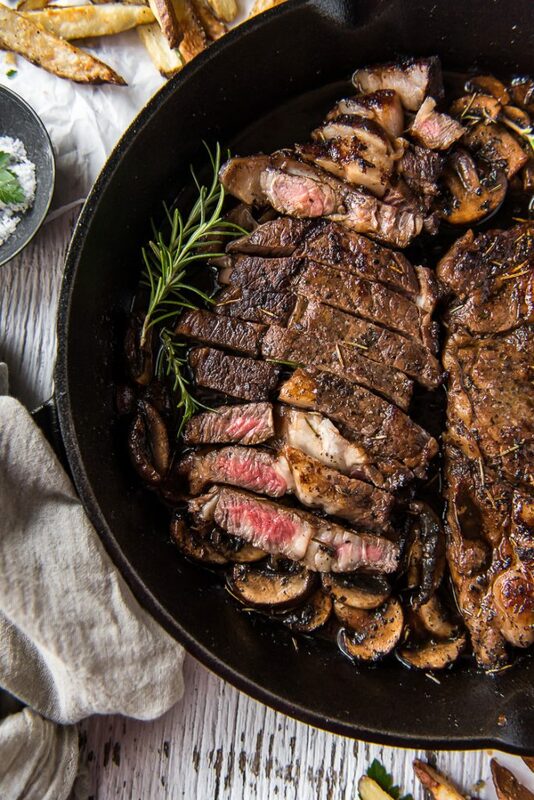 Once you learn how to cook the Perfect Cast Iron Steak at home, your steakhouse dinner days will be over! A simple marinade, a hot pan, and a little butter is all you need to turn a boring slab of beef into a gourmet meal. 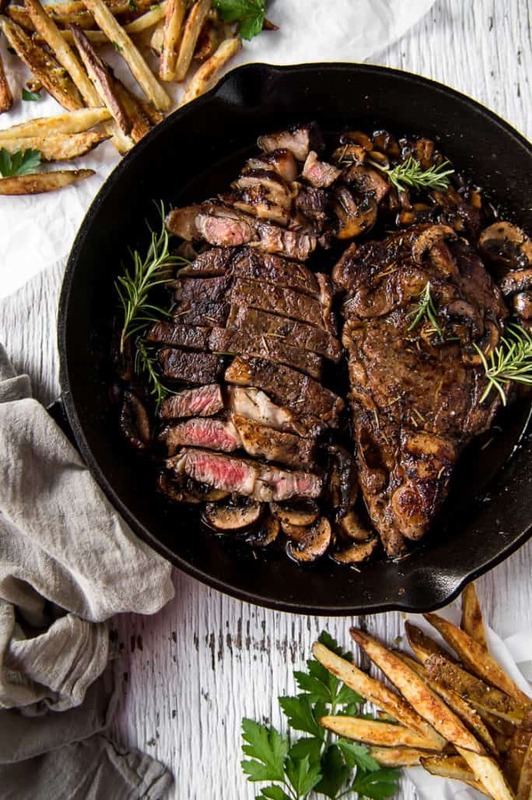 If you ask my hubby, there’s no quicker way to the heart than a delicious steak dinner. I tend to agree, especially if there are crab cakes involved in that dinner somewhere. Many evenings over the last decade have found us at Texas Roadhouse or Longhorn, playfully arguing over who’s steak tasted better. Nowadays, we just prefer agreeing that our way of cooking steak is the best way, and right from our own dining room. JUST TAKE ME TO THE PERFECT CAST IRON STEAK ALREADY! 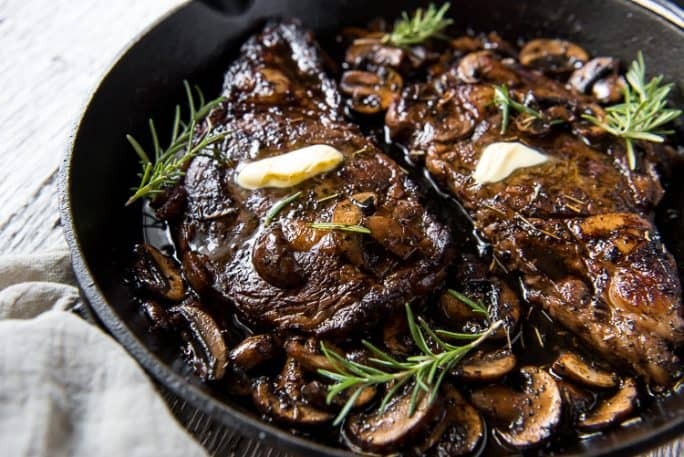 If you’d rather skip my (pretty darn helpful) tips and tricks, essential cooking info, and similar recipe ideas – and get straight to this deliciously easy cast iron steak recipe, just scroll right on down to the bottom of the page where you can find the printable recipe card! I’m not going to say that cooking steak in a cast iron skillet is the be-all-and-end-all of beef recipes. I will say that there’s nothing quite like a ribeye steak, seared and smothered in butter and sauteed mushrooms. 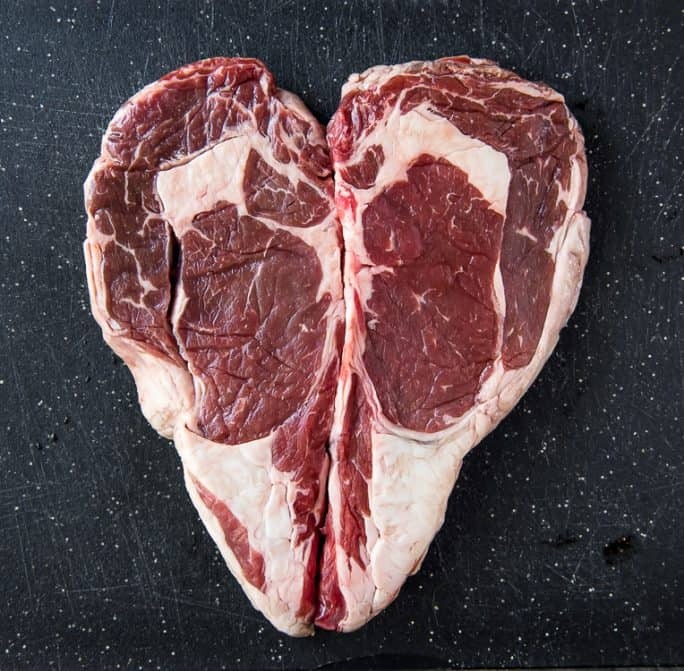 And, not to mention, a completely romantic meal to make for a special someone who also shares your love of tasty beef. 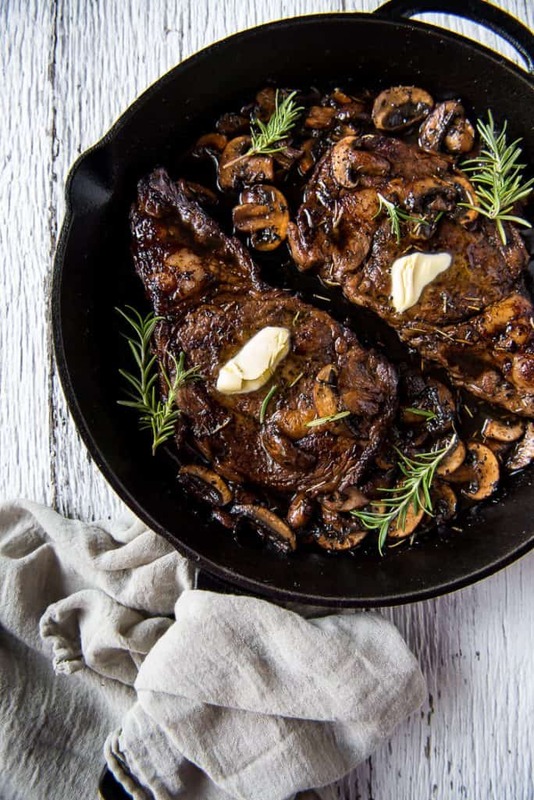 Is It Healthy To Cook In Cast Iron? It is absolutely safe and healthy to cook in cast iron skillets! Iron is an essential mineral to humans, and iron deficiency is common all over the world. Every time you cook in your cast iron skillet, a little of the iron leaches into your food – increasing your mineral intake just by eating normal food! There are multiple ways to tenderize a steak – everything from physically tenderizing it with a mallet to giving it a salt rub. Beef usually needs at least two hours to adequately tenderize and soak up the flavors of the marinade. However in many cases, the longer you marinate, the better the flavor and texture of the steak will be. This depends on what cut of beef you are marinating, of course. The tougher the meat is, the longer you should marinate it. I usually let my steaks marinate overnight at least, and sometimes up to 24 hours. The ribeye steaks I used in this recipe only marinated for 2 hours. 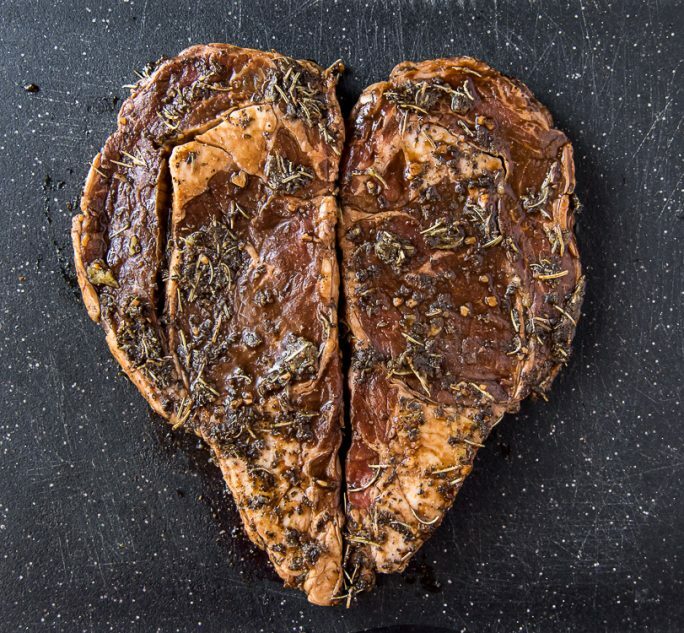 Ribeyes are a more tender cut, and marinating isn’t necessary – we just love the flavor! First, be sure to remove the steaks from the refrigerator and marinade 1 ½ to 2 hours before cooking. For optimal tenderness, they should be at near room temperature prior to searing. When you’re ready to cook, place a large 12-inch cast iron skillet on the stove over high medium-heat. Allow the skillet to heat up for 3-4 minutes so it’s hot to the touch. Next, add butter and oil. Melt and swirl it together for another 2-3 minutes until it is shimmering and sizzling. Then, carefully set the steaks in the skillet. Cook them for 2 minutes, then flip and repeat on the other side. Reduce the heat to medium-low. Continue flipping the steaks every 2 minutes for a total of 8-12 minutes, until it reaches your desired doneness. Finally, remove the steaks from the skillet and place them on a cutting board. Cover them loosely with foil and allow them to rest at least 10 minutes before serving. Top with butter and garnish with fresh rosemary if desired. LOOKING FOR MORE CAST IRON RECIPES? Join in on the fun in our Facebook group! Feel free to share YOUR favorite recipes, ask questions, help out your fellow home cooks, and see what’s new with The Crumby Kitchen (so that you never miss a new recipe)! If you’d like to check it out, you can request to join HERE. Also, don’t forget to follow us on Instagram and tag #crumbykitchen so we can see all the wonderful recipes YOU recreate from this site! In a small bowl, whisk together marinade ingredients. Add steaks to a resealable zip lock bag or large bowl and pour the marinade on top. Marinate in refrigerator for at least 2 hours, or up to 24 hours. Remove the steaks from the fridge and marinade 1 ½-2 hours before cooking, allowing them to come to room temperature on a cutting board. 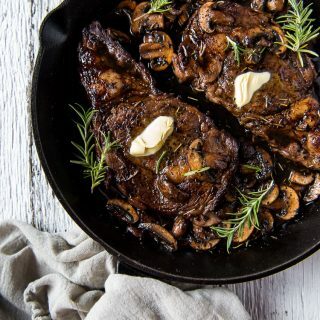 Set a large 12-inch cast iron skillet over high medium-heat, allowing it to heat up for 3-4 minutes. Add the butter and oil and heat another 2-3 minutes until shimmering and sizzling. Carefully set the steaks in the skillet. Cook for 2 minutes and then flip and repeat on the other side. Reduce the heat to medium-low. Continue flipping the steaks every 2 minutes for a total of 8-12 minutes, until it reaches your desired doneness. Remove the steaks from the skillet and place them on a cutting board. Cover loosely with foil and allow to rest 10 minutes before serving. Top with butter and garnish with fresh rosemary if desired. 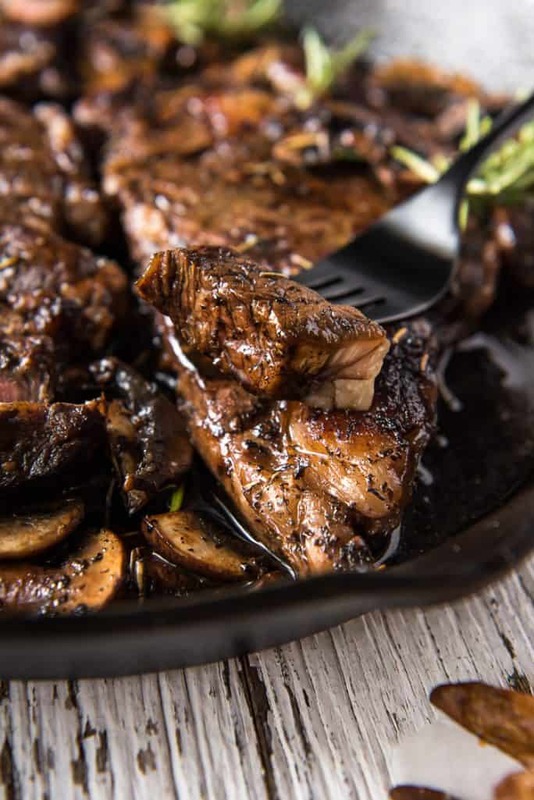 PIN THIS CAST IRON SKILLET STEAK FOR LATER!